Domenicus van Wijnen (1661–1698), Allegorical Scene (1680-90), oil, dimensions not known, Private collection. Wikimedia Commons. Radical originality in painting is rare, even among the Masters. It’s something which characterises the work of Hieronymus Bosch, for example, but not Peter Paul Rubens. And I think it is manifest in the paintings of Domenicus (or Dominicus) van Wijnen (1661-1698). Very little indeed is now known about van Wijnen. He was born in Amsterdam, was in training with Willem Doudijns in The Hague in 1674, and is believed to have worked in Rome between about 1680 and 1690. He then returned to Amsterdam, where he is thought to have died and been buried late in 1698. He was one of many painters of the Dutch Golden Age who worked in Rome. At that time, both in the Netherlands and Italy, painting was regulated by the guilds, and van Wijnen is believed to have been admitted to the Guild of Saint Luke in the Netherlands, probably on completion of his training with Doudijns. This qualified him to work in Rome, where the local guild respected the freedom of movement of artists, but like many other Flemish and Dutch painters there, he joined the group of emigré painters known as the Bentvueghels (meaning birds of a feather, also known as Schildersbent or Bentvogels), which was active for around a century from 1620. Domenicus van Wijnen (1661–1698), Initiation ceremony of a Bentvueghel in Rome (c 1700), engraving by Matthijs Pool from an original now lost, Rijksmuseum, Amsterdam, The Netherlands. Wikimedia Commons. 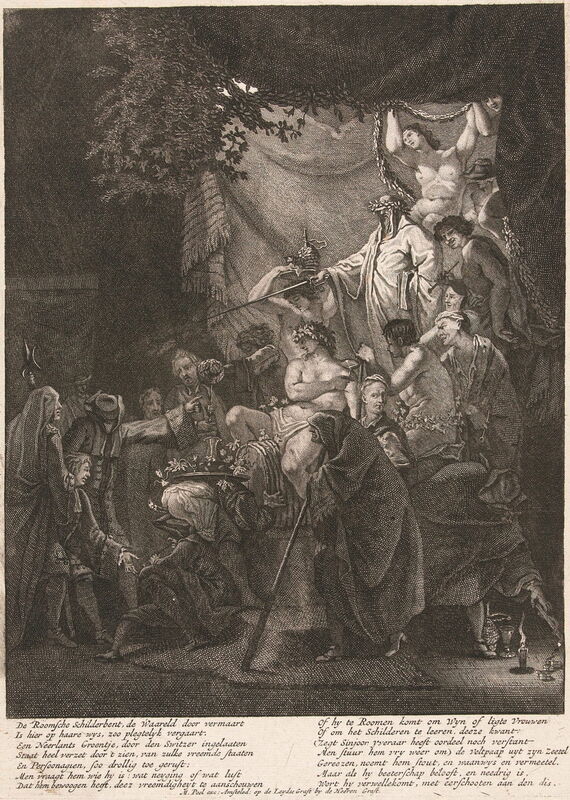 Van Wijnen probably painted his initiation into the Bentvueghels, which was later turned into this engraving by Matthijs Pool. It was, by all accounts, a rowdy and thoroughly Bacchic procedure, also shown by an anonymous artist, below. 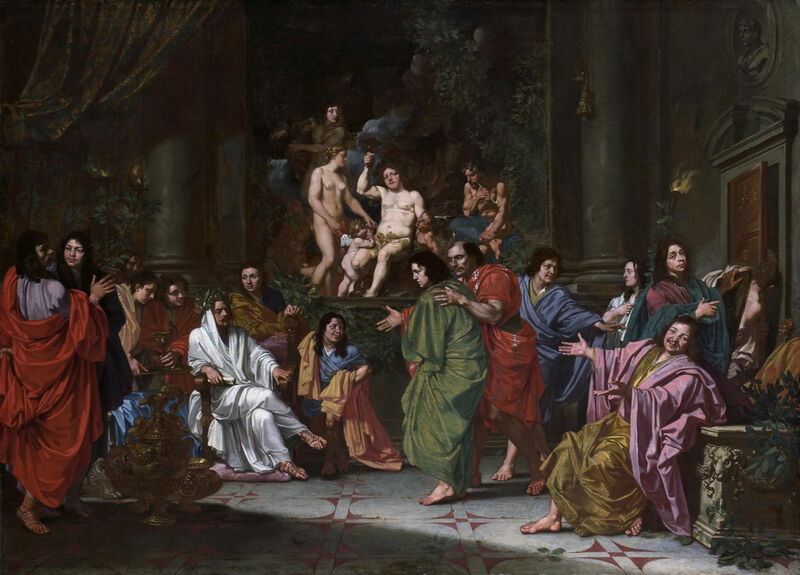 Artist not known, Initiation of a Bentvueghel in Rome (c 1660), oil on canvas, 95.5 × 134 cm, Rijksmuseum Amsterdam, Amsterdam, The Netherlands. Wikimedia Commons. Once a member, van Wijnen painted under the name of Ascanius, the son of Aeneas, also Aescanius or Askaan. Few of his works have been dated, but most of those which survive seem to have originated during the decade that he spent in Rome, and centred on the theme of witchcraft. 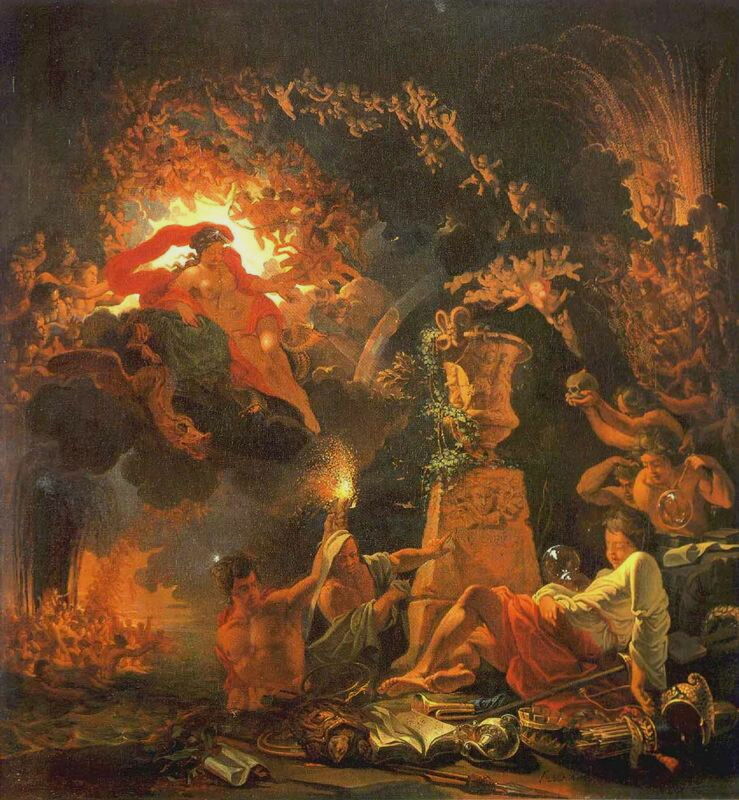 Domenicus van Wijnen (1661–1698), Astrologer Observing the Equinox and a Scene of Parting Adonis and Venus (c 1680), oil on canvas, 41 × 49 cm, Muzeum Narodowe w Warszawie, Warsaw, Poland. Wikimedia Commons. Astrologer Observing the Equinox and a Scene of Parting Adonis and Venus is probably one of his earlier works from this period, and shows a curious combination of an astrologer (not astronomer) at the left, who is studying celestial charts, with the mythical lovers Venus and Adonis, at the right. In front of the couple is a muscular male with transparent wings, who might be a rather different form of cupid. Adonis is a notoriously beautiful young man, born from a myrrh tree. 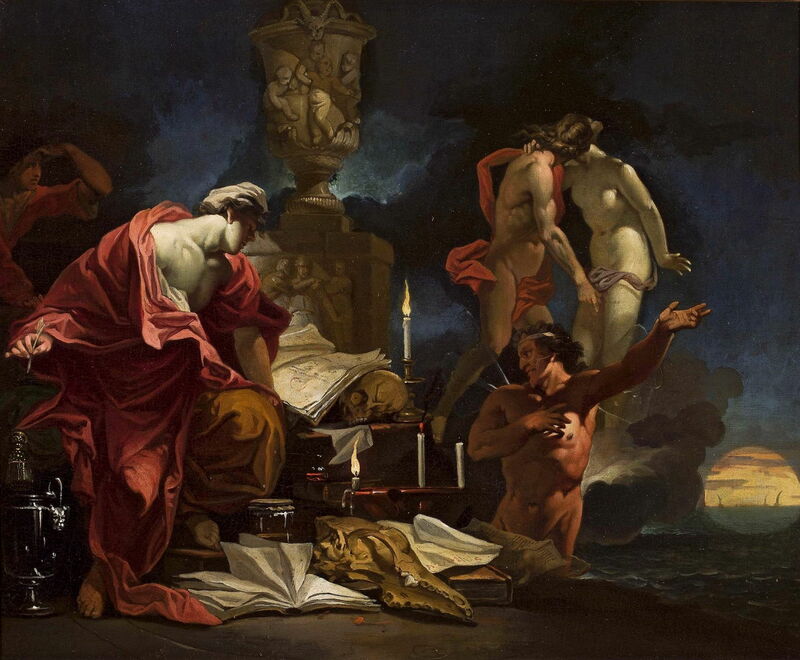 Both Venus and Persephone fell in love with him, but he was killed by a wild boar. The love between Venus and Adonis is the subject of what was probably William Shakespeare’s first published work, a poem recorded in 1593. It was also a very popular theme for painting, although I cannot recall it in such a strange setting. Domenicus van Wijnen (1661- c 1695), Medea Rejuvenating Aeson (date not known), oil on canvas, 46 × 53 cm, Musée des beaux-arts de Pau, Pau, France. Wikimedia Commons. Medea Rejuvenating Aeson invokes alchemy and witchcraft in telling the story of the sorceress Medea, who reclines naked in Hecate’s golden chariot, pointing her wand at the body of Aeson lying on the ground, as she casts a spell to rejuvenate him. Above her, a glass sphere containing a small devil shoots a trail of flame and sparks like a rocket. Medea is assisted by four putti and has what appears to be Hecate herself behind her, and a full moon is seen rising above the horizon. Scattered around the scene are objects associated with witchcraft, including a glass cauldron, a jar of brown liquid, a sacrificial knife, old books, and a burning candle. Domenicus van Wijnen (1661–1698), The Witches’ Sabbath by Moonlight (date not known), oil on canvas, 73 x 57.5 cm, location not known. Wikimedia Commons. 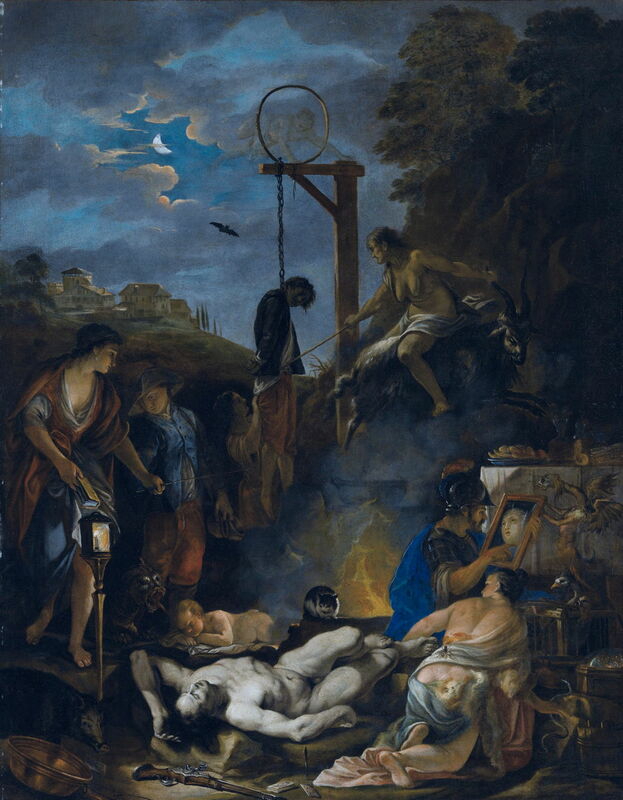 Van Wijnen explores the theme of witchcraft further in The Witches’ Sabbath by Moonlight, which is set in a moonlit Italian landscape. This combines many of the now-classical symbols associated with ‘the dark arts’, and is taking place at an outdoor altar set up at the foot of the gallows, on which a dead body hangs. Two women are shown as witches: an older one riding a horned goat facing backwards, who is leaping over a very large smoking cauldron, and a younger woman at the left, who has a wand in her left hand and is accompanied by a boy. Clustered in front of the altar at the right is a soldier in armour, who is looking in a mirror at the image of another, and another woman who is kneeling, and holding a snake in her right hand. Nearby is the dead body of a robber, his gun by his head, an infant, and a cat. The surface of the altar has been prepared with bread and wine, and there is a small chimera by it. A bat flies in the distance, and a transparent figure is passing through a hoop mounted on top of the gallows. Domenicus van Wijnen (1661–1698), The Witchmaster (date not known), oil on canvas, 75 × 62.5 cm, location not known. Wikimedia Commons. In The Witchmaster, also set in the Italian countryside at night, van Wijnen has adjusted the symbolic objects, removing the altar and making the supervising witch into a bearded man. There are two novel introductions: a wild boar breathing fire which resembles that emerging from the glass sphere in Medea Rejuvenating Aeson, and references to images in the form of a reflection in a mirror of the woman at the lower left corner, and an odd viewing box in the centre of the foreground, which has a painting within the painting. Domenicus van Wijnen (1661–1698), Allegory of the Creation of the Cosmos (date not known), oil on canvas, dimensions not known, Pavlovsk Palace, Saint Petersburg, Russia. Wikimedia Commons. 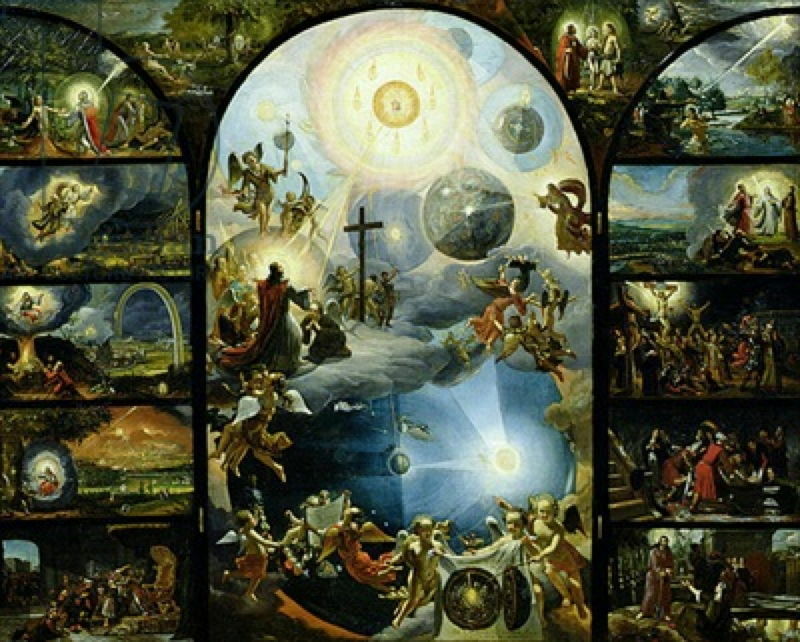 Van Wijnen seems to have painted some religious works too, although the only example I have been able to find is his remarkable Allegory of the Creation of the Cosmos now in the Pavlovsk Palace in Saint Petersburg, Russia, and only accessible in this poor-quality image. The smaller scenes at its edges appear to trace the Biblical account of creation, and the life of Christ. At its centre is an extraordinary image which appears quite unique. Most remarkable of all van Wijnen’s works are two which extemporise on streams of figures. Allegorical Scene looks like one of the more extreme faerie paintings from Victorian Britain, but was painted almost two centuries earlier. A strange collection of objects lies at the foot of a terracotta urn: these include a large tortoise, a shield, an open book, a trumpet, a quiver full of arrows, a spear, and an oil lamp. 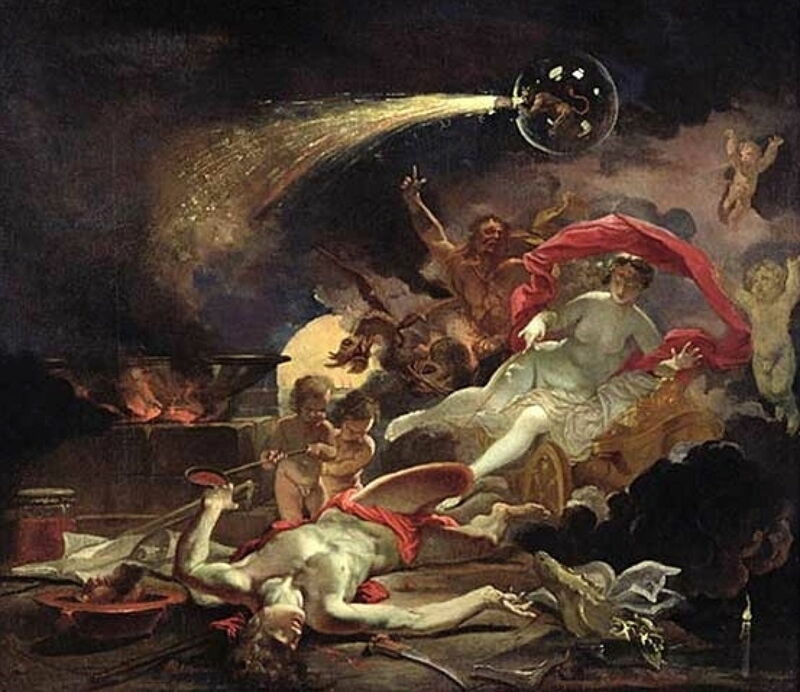 At the upper right, hundreds of small putti are being ejected from below, arcing over the top of the painting, and coalescing around a goddess who is lit brightly from behind. Below her is a river, in which large numbers of naked bathers are congregated, and they too appear to rise up into the sky in another stream of figures. 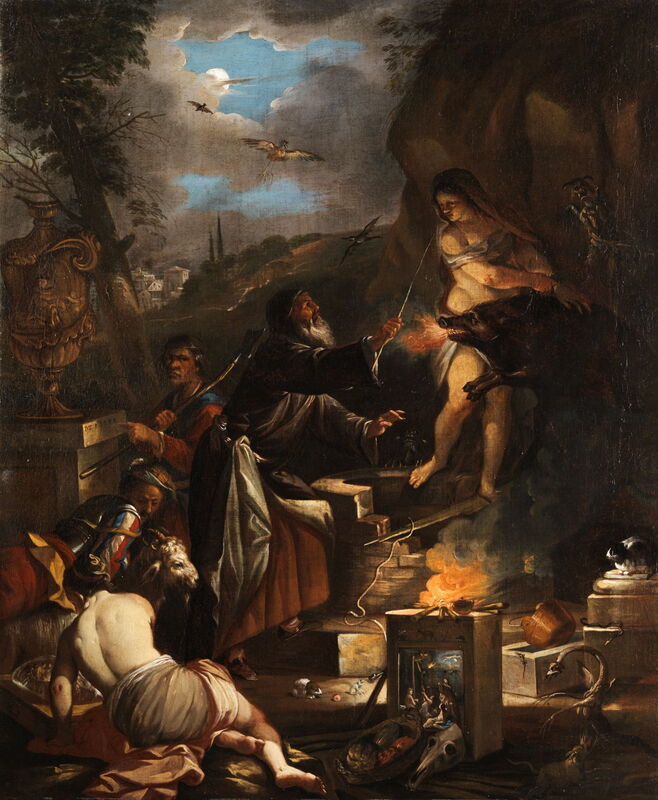 Domenicus van Wijnen (1661–after 1690), The Temptation of Saint Anthony (c 1685), media and dimensions not known, The National Gallery of Ireland, Dublin. Wikimedia Commons. 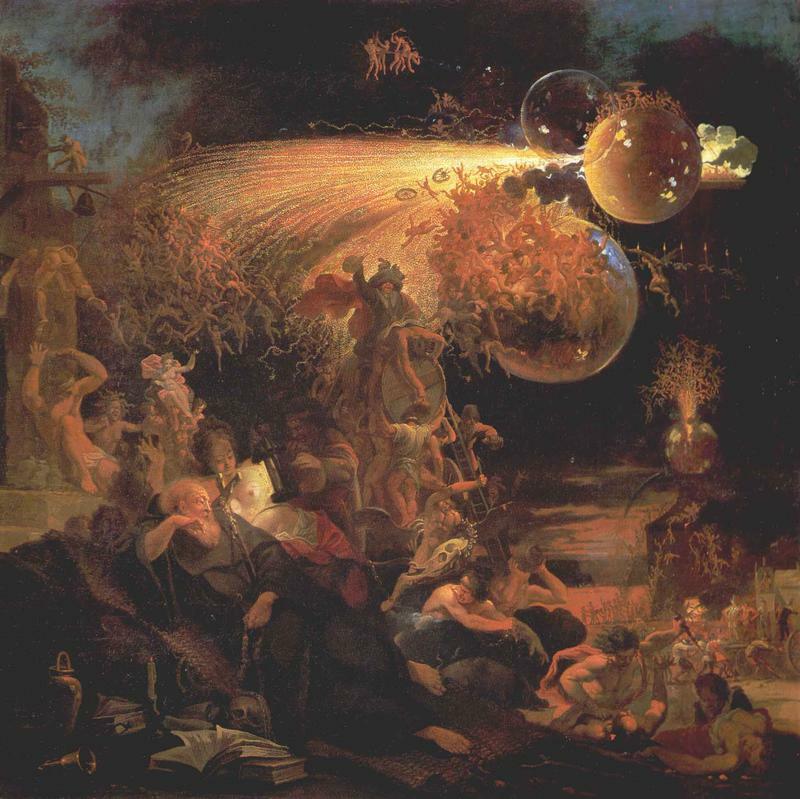 Similar streams, and a jet of sparks and fire from a sphere, appear in van Wijnen’s The Temptation of Saint Anthony. There is another complex collection of symbols in and around the figures on the ground. Van Wijnen’s unique imagery may have inspired later work too, such as William Blake’s Whirlwind of Lovers, perhaps via the intermediate of Fuseli’s more imaginative paintings. 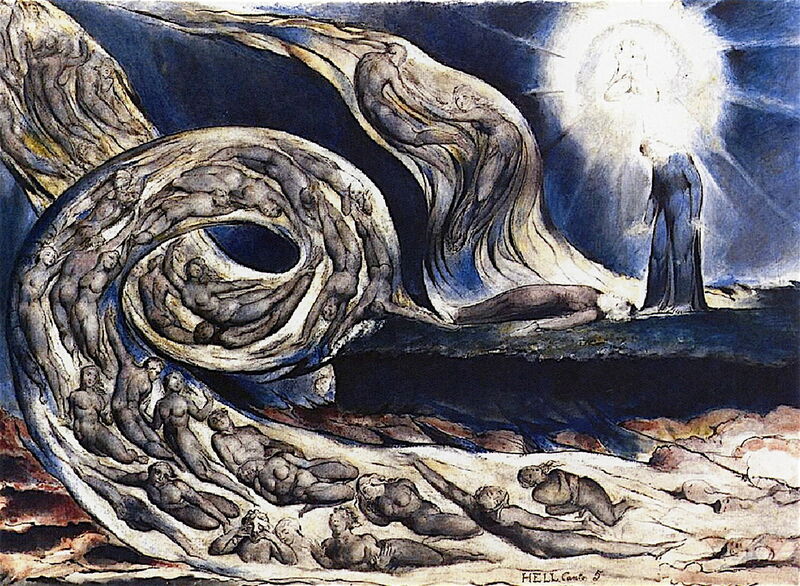 William Blake (1757–1827), The Circle of the Lustful: Francesca da Rimini (The Whirlwind of Lovers) (c 1824), pen and watercolour over pencil, 36.8 x 52.2 cm, Birmingham Museums and Art Gallery, Birmingham, England. The Athenaeum. 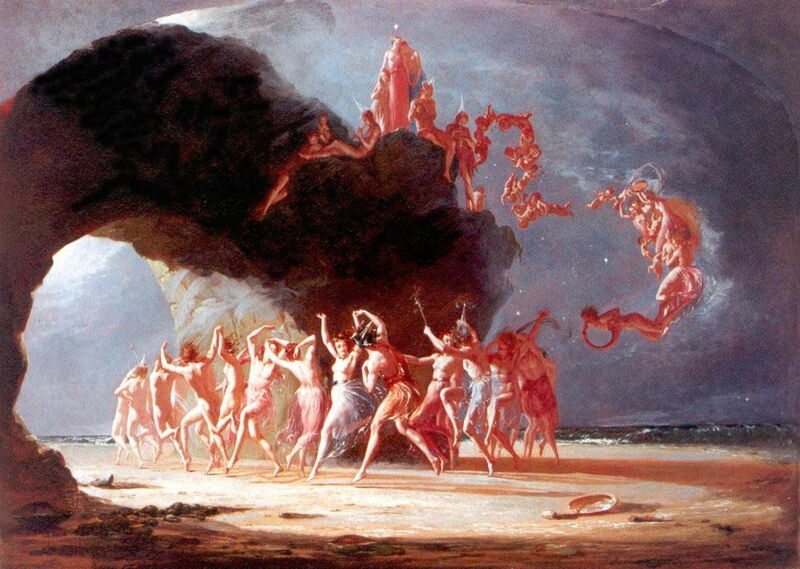 These in turn may have been inspiration for faerie paintings, such as those of Richard Dadd. Domenicus van Wijnen’s paintings – particularly his Allegorical Scene and The Temptation of Saint Anthony – are radically original, like nothing before, and not really matched for over a century after. I cannot understand why they are now so little-known, and why so little research has been carried out on his life and work. Hopefully this may inspire someone. Posted in General, Painting and tagged Blake, Dadd, faerie, painting, van Wijnen. Bookmark the permalink. Thanks a lot for this. I came across van Wijnen for the first time yesterday, and now I know a lot more about him. His brushwork is plainly a Faery Feller’s Master-Strokes.